The definition of a contaminant is any foreign “something” that enters a lubricant during formulation, packaging, transport, storage or service. Contaminants compromise the lubricant’s integrity, performance and service life as well as impart harm to the machine. No lubricant is indemnified from their effects or can safely co-exist with contaminants. 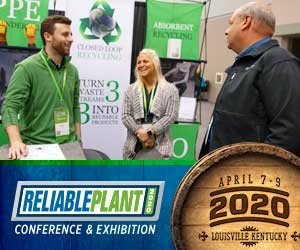 So too, there are no lubricants or machines that can realistically be defined as contaminant-free. 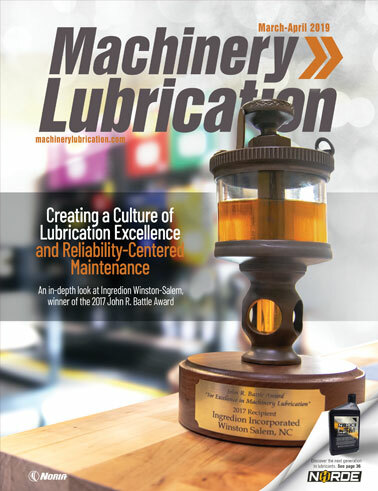 The hazards brought on by various types of contaminants have been covered extensively in the pages of Machinery Lubrication magazine. We’ve shown how the damage can progress slowly or attack suddenly and destructively. Either way, contaminants are a serious lubricant disease that merit vigilant attention by lubricant analysts and reliability professionals. Solid contaminants (also known as particles) come in wide-ranging sizes, shapes, hardness and composition. Often missed in the discussion on particle contamination are the ghost riders that lurk in your oil. These contaminants, which go unnoticed by maintenance staff and unmeasured and unreported by oil analysis labs, need to be exposed and understood. Figure 1. Small particles can pass unimpeded through a filter. 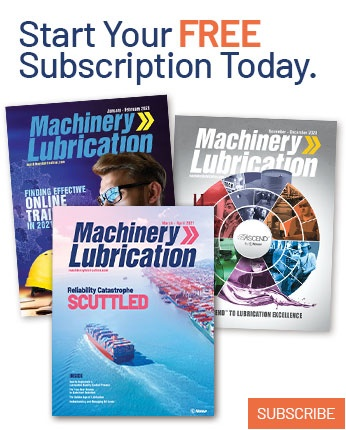 Today’s owners of lubricated mechanical assets want to minimize maintenance and repair costs. Consumables like lubricants are often targeted for cost reduction. 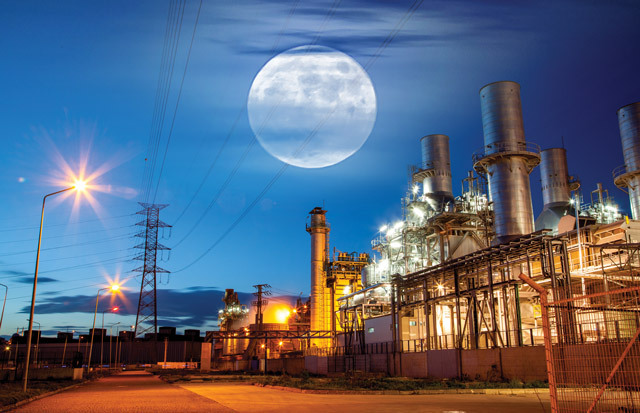 These days, lubricants are formulated to be increasingly robust and resistant to chemical degradation from heat, oxidation and operating conditions. This physical and chemical stability enables fewer oil changes and lowers the cost of lubricant consumption. This is a good thing, but sadly there is a downside to extended oil drains or, in some cases, no oil drains. The longer a lubricant remains in service, the longer it is exposed to particle contamination from a variety of ingression sources. Additionally, most particles that invade a lubricant are very small. Small particles enter more easily than large particles. For instance, for each 10-micron particle that ingresses into the oil, there may be ten 3-micron particles. This small-particle dominance is compounded further by filtration. Most machines with circulating oil have filters. However, most filters remove particles based on size exclusion. This means they don’t remove all particles but rather just certain particles above specific micron sizes (based on the average pore size of the filter media). For simplicity, we can refer to this as the filter’s particle size cut-off. Those particles larger than the filter’s size cut-off are conveniently disposed of with each filter change. The particles smaller than the filter’s size cut-off stay with the oil and in the machine. This results in a growing population of small particles that are uncontrolled by filtration. Because of their extremely small size, they also are not prone to settling (Stokes' law) but rather embed tightly into the oil, held by viscosity, circulation and Brownian motion (like food dye in water). To what size of particles are we referring? Well, if the filter has a 10-micron cut-off, then all particles smaller than 10 microns are ghost riders. By total weight, most of these particles may be submicron (i.e., less than 1 micron in size). These include organic matter (soft, insoluble contaminants that can lead to sludge and varnish) as well as inorganic hard particles from environmental dust and wear debris. Remember, the human eye can see particles down to about 45 microns. Therefore, we can confidently say that ghost riders are only visible with the aid of microscopes and similar laboratory methods. Don’t assume you’re completely safe if you have a good filter, even if it is a high-capture-efficiency 3-micron filter. Yes, filters are important, and many deliver exceptional performance by mitigating the exposure and risks of particle contamination. When larger particles are quickly filtered from the oil, they can’t damage machine surfaces and can’t be crushed into small particles in the size range of our ghost riders. For sure, good filtration is essential to contamination control. Many machines are exposed to periodic or continuous boundary lubrication. This means that, due to slow speed and/or high unit loading, the lubricant is unable to maintain an oil film. This results in surfaces that rub mechanically in sliding frictional zones. Wear is only controlled by the mitigating action of extreme-pressure (EP) and anti-wear additives. However, these additives do little to impede the abrasive damage caused by small particles, leading to polished and honed surfaces under common boundary conditions. The higher the population of these small particles, the more wear damage that results. Of course, where there is wear there is excessive friction, higher energy consumption and negative environmental consequences, all of which are not good. Small particles are commonly referred to as silt-sized particles or just silt. These particles can jam and pack into narrow oil ways, glands and orifices. They can restrict oil flow, leading to lubricant starvation, and impair mechanical movement (e.g., in a servo valve), causing motion impediment. A high density of small particles exposes the oil to an extensive amount of surface area (the collective outer-shell surfaces of all particles). Many of the lubricant’s additives are polar, meaning they are naturally attracted to both machine and particle surfaces. Examples include friction modifiers, dispersants, rust inhibitors, metal deactivators, detergents, anti-wear and extreme-pressure additives. When these additives hitch a ride on particles, they lose their functional value to the oil and machine. The particles occupy (tie up) this role instead. 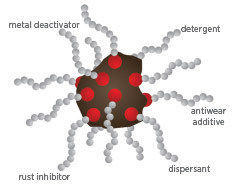 The scrubbing of additives by small particles is a common additive depletion mechanism. The more particles, the more the depletion. This results in lost or impaired corrosion protection, oxidation stability, film strength, dispersancy (soot control) and deposit control. Many particles are emulsifying agents. In other words, they inhibit the natural settling of free water out of the moving oil and instead bind the water into a tight emulsion within the body of the oil. This allows the water to be carried into frictional zones, leading to accelerated wear, and also exposes the polar oil additive to microscopic water globules, contributing to hydrolysis and depletion. Small rust particles are particularly prone to forming oil-water emulsions. Metal particles (especially iron and copper) promote or catalyze base oil oxidation. This condition is more pronounced when the particles are in the presence of abnormal levels of heat and water contamination. Wear debris is the principal source of metal particles in the oil. If this debris is not quickly filtered out, these particles can be crushed into smaller particles. The comminution of particles exposes a greater nascent metal surface area to the oil and its additives. Eventually, the oxidation inhibitors are spent (fully depleted), and the base oil reaches its breaking point, followed by a runaway state of oxidation. There is no way to remediate oxidation other than a complete drain, flush and oil change. All lubricants have significant levels of dissolved air (invisible to the naked eye). Changes in oil pressure and temperature can cause the air to evolve from a dissolved state to a bubbly, entrained-air state (Henry’s law). Small particles aid the transition by providing nucleation sites for emerging air bubbles. Highly pure lubricants have a greater tendency to produce large, buoyant air bubbles (rapid air release). Conversely, highly contaminated oils, including those rich with organic solids, lead to the formation of small air bubbles, which impair buoyancy and result in slower air detrainment (Stokes' law effects). As has been discussed previously in this magazine, there are numerous negative consequences to bubbly, aerated oil. occupied and unable to perform their intended function. Many machines that hold large volumes of circulating oil have no scheduled oil change interval. Instead, oil analysis is used to alert the approaching end of the remaining useful life (RUL). This is referred to as a condition-based oil change. This works very well if the tests conducted by the laboratory fully assess all factors that define the oil’s health and condition. For instance, if you only monitor oxidation stability, the premature depletion of corrosion inhibitors might go unnoticed. Condition-based oil changes depend on vigilance and the comprehensive assessment of all important factors and attributes of lubricant health and performance. Some labs do a good job with this. Others cut corners. Many common laboratory methods have substantial blind spots when it comes to quantifying the actual concentration of small particles in oil. This is true for particle counting, elemental spectroscopy, ferrous density, analytical ferrography and others. 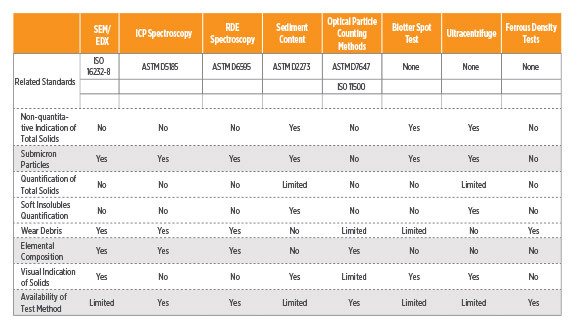 Table 1 provides a list of various oil analysis tests and the ability of these methods to quantify or even roughly indicate the presence of ghost-rider size particles in oil. One test stands out due to its capability to report a single numerical value for total solids (hard and soft). This test is gravimetric analysis. It can be enhanced using solvents like toluene and hexane to isolate and quantify the soft insoluble particles and hard particles separately. Other tests in this table can also be effective, especially when combined with additional testing methods. 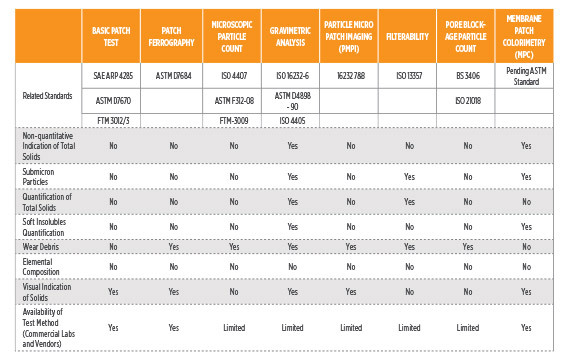 For example, data from two or more of the following tests can provide a practical understanding of small particle contamination: ultracentrifuge, MPC, blotter spot testing, elemental spectroscopy and submicron patch testing. Some types of depth filters have the ability to remove many particles well into the submicron range. This can impart significant control, particularly if the filters are used throughout the life of the oil. Often the effectiveness of these filters will vary depending on the particle size and composition. There are also charged-particle separators of various types that can prove effective. When all else fails, the most practical solution may simply be to perform an oil change. This is a more logical choice for small sump machines compared to those holding thousands of gallons of oil.